No. 2, Jalan Kapar 27/89, Seksyen 27, 40400 Shah Alam, Selangor, Malaysia. All the directors are hand on in their works. Our marketing and service teams are committed and capable to provide quality products and superior services to our valued customers. Also, we equip our own people with proper skills, training and tools of the trade to enable us meet the stringent demands of our clients, for value-added products and services. With our many years in this service line, our people have all the technical knowledge of most of the major brands in the market e.g. BT, Nissan, Toyota, Komatsu Jungheinrich, Nichiyu etc. 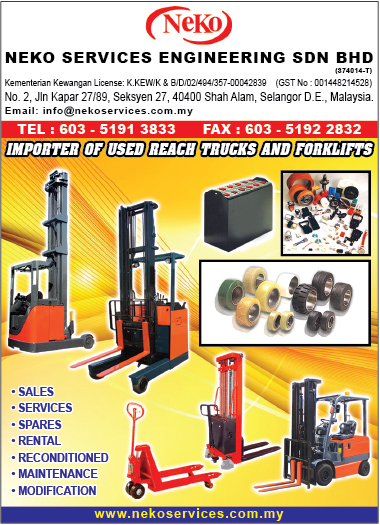 We are also one of the major importer and distributor of used reach truck, battery-forklifts and engine forklifts from Japan with appointed dealers in and around major town throughout Malaysia. Our goal is to provide better service and quality products to all our customers and strive to maintain our status in the country. 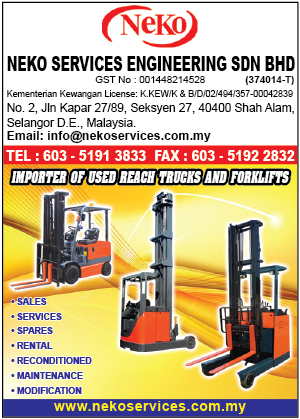 We are also the importer for used Forklifts and Reachtrucks.